Welcome to Zoulah's Halloween Bash and to Metamorphasis Monday! This is Zoulah's first time linking to Metamorphasis Monday. Zoulah not only loves cooking in her Bewitchen Kitchen at Halloween, but she also loves to craft. Zoulah and her twin sister Beaulah, residing at Purple Chocolat Home are both hosting a Halloween Bash this Halloween. 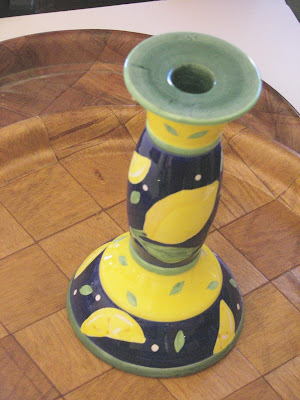 Zoulah found this glass candlestick at the local thrift store for $2.00. 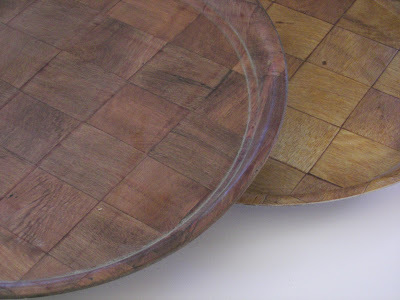 These wooden trays were $1.00 each. 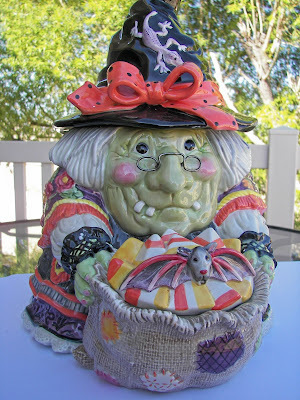 When Zoulah saw these, her witchie eyes started to hatch a Halloween craft. 1. Gather together an ugly candstick and an ugly wood tray. 2. 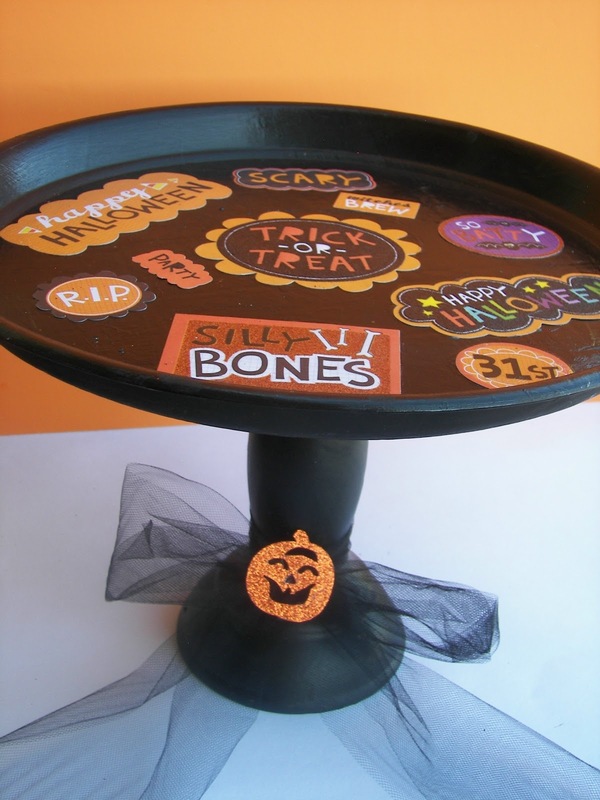 Paint tray and candlestick with acrylic black paint, or your choice of paint color. Let paint dry. 3. 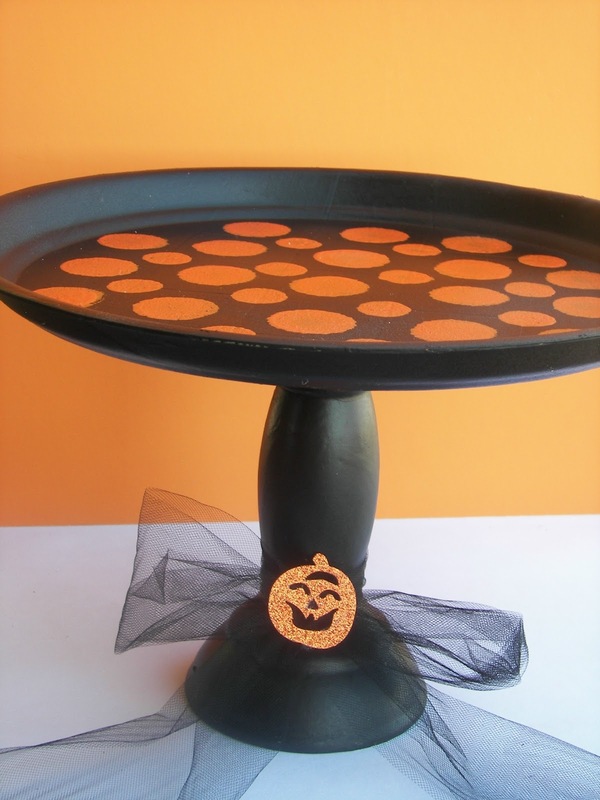 Apply miniature Halloween signs or use a stipple sponge to make polka dots (see pedestal above). Wal-Mart sells a package of stipple brushes. Zoulah found the little signs in a package at Michael's Craft Store last year -- they have similar things this year. See the pedestal below. 6. Let dry and glue, with a glue similar to E-6000, the tray to the candlestick. 6. Add a tulle bow and a little Halloween Jack-O-Lantern. Wal-Mart has these glittered Jack-O-Lanterns and other large confetti shapes for one dollar for a package. There are at least 20 pieces of Halloween confetti in each package. Zoulah's Notes: Originally, Zoulah was going to make a double-tiered pedestal, but she didn't like the look with these trays. She only bought one candlestick and had to share the candlestick for these pictures and needs to find another one at the thrift store. Because of the Modge Podge and sealant, Zoulah wouldn't recommend serving food, like cookies on this tray. She feels that cupcakes, and candies, and cookies in little dishes would be fine. Zoulah also has a round glass clear cake plate that fits perfectly on the pedestals to protect the food. Zoulah can't wait to serve some of her food from her Bewitchen Kitchen on these Halloween Pedestals! 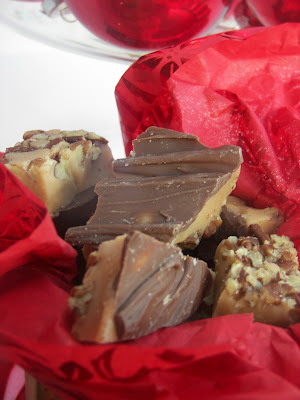 Joni, This is my favorite month at Red Couch and Purple Chocolat! Can't wait to see what you 2 come up with! Hope I make it till the end of the month without missing anything! I'm loving this pedestal- just adorable! So Creative. Love that you bought cast-aways and made something awesome with them. Oh my, I love the both trays!! Thanks for the inspiration from Zoulah!!! I can't tell you which one I like better! Beaulah can't either. I was sure I would like the polka dots best and then I saw the 2nd one and it is adorable too. Very cute project and so inexpensive. Zoulah rocks! These are fanastic. Zoulah is very witch-crafty. Wow! Wonderful job from Zoulah! Thanks for sharing. He just added two spoonfuls of sour cream to the milk and wisk it up, then into the Bisquick! "Mr. Ed" has been published in an Alumni Cookbook and watches Barefoot Contesa with me, occasionally! Thanks for asking. Enjoy! Zoulah - you always have such creative ideas for celebrating Halloween! I can't wait to see your recipes, too. Thanks for dropping by for a visit. That's witchin! I bet Z fills it up with some great treats too! I've been sending all kinds of wonderful stuff like this to DI recently. Look what you've created Zoulah, I'm green with envy! Oh I just love your pedestal! 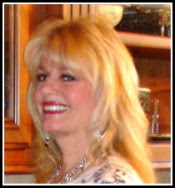 I hope you will add your lovely metamorphosis to my Fall in Love linky party on Wednesday. Really cute pedestals :) and so perfect for halloween. that's a really cute halloween pedestal! really adorable. I'm a new follower and excited to look at your other projects on here. take care! Awhh! This is super cute! That is just adorable and clever! That Zoulah is one creative house guest, isn't she? Maybe she has a third sister named Oolah that she can send my way. I love this I think I am going to hit up the nearest thrift store and see what treasures I can find!